To finish this year of celebrating our 60 year history as a company, we have one more special honoree we want to introduce you to… meet Gregory Fox! Greg works in Kalas’ Plant 2 operating Extruder #1. This year marks his 32nd year at Kalas. Starting in May 1987, Greg was hired to operate the very machine he gets to run today. 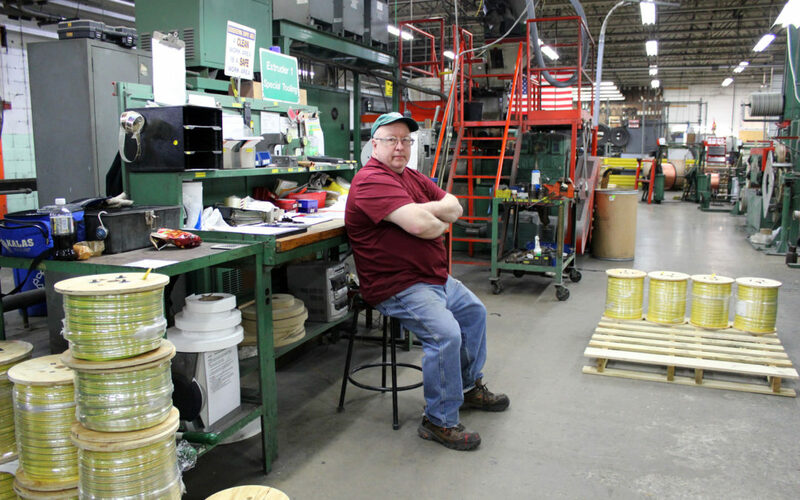 Throughout his years he’s operated various machines at Kalas, but primarily Greg has been our sole Extruder #1 operator. His level of skill and experiential knowledge he brings to Extruder #1 after his 3 decade long history is unmatched. In the past 32 years Greg has seen a lot of Kalas history. He started on his machine when Kalas was located all out of what is our current day Plant 1. He’s seen buildings acquired, additions constructed, machines moved including his own workspace and more. Another unique aspect of his long history is his having been able to see the changes in leadership as our three-generation company unfolded. Some of his favorite memories are when a past president Paul Witwer would regularly come around and shake every associate’s hand to personally thank them for their work at Kalas. He also remembered a funny moment when another Kalas company founder, Walter, scolded him for parking in Walter’s personal space! With 32 years of time, Greg would be full of memories like this. Through all of Greg’s years and considering every aspect of his career, the most meaningful thing about his longevity at Kalas are the men he gets to work with. When you consider 32 years of life, Greg has literally grown up with the men he works with on day shift. Most of the men he works with are his same age and have been with our company for almost as many years or more than Greg has. Not many people in any field of work can share that same depth of connection with their co-workers. Greg has enjoyed the longtime relationships with his coworkers and the security of his job for now over 30 years. At Kalas we are incredibly grateful for men like Greg who display loyalty, hard work and appreciation for their time here. Join us in thanking Greg for his 32 years of hard work and for what he has brought to the Kalas family each and every day of his time here. We are thankful for you Greg!